hese villas are private and equipped with swimming pool, jacuzzi and garden, ideal place for romantic honeymoons and summer holidays with families of 4-5 people. Choose a safe holiday, discover what our guests think about us by reading the reviews of our Tuscan villas indicated in the pages of each villa or directly on tripadvisor. t is possible to book directly through the form visible on each villa, you can directly book a villa with swimming pool, saving the intermediates costs. 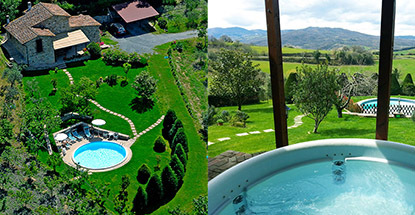 Spend a dream in the Tuscan countryside, where to have in exclusive the cottage, the pool, the jacuzzi and the area that surrounds it, where to hear only the nature. We guarantee your privacy and your relax. Among the services offered there is the possibility to taste the Tuscan cuisine thanks to a chef who will cook for you inside the Villa for an unforgettable evening. You can contact us directly via email, phone or through the contact form you find on the website to the right of the villas page. It is possible to check the availability of the villa directly on the villas page, we will try to reply to your request as soon as possible (1 or 2 hours maximum). You can confirm your booking through tripadvisor or via paypal (25% of the total price). he date of construction of this farm dates back to 1857. At the beginning of 1900 the Centopino farm was sold by Cleonte Giorgi to Pasquale Francioli and Filomena Micheletti. At their death, the place passed by inheritance to Francioli Gino, father of the current owner Francioli Gina. The oldest document that bears the toponym Centopino is the cadastre of 1427. Following is the quotation of this cadastre: Sustanzie by Paolo di Piero called Paldozo: << A vineyard in centopino with tera lavoratia staia 1 and casalino estimate lire 40 >>. In the year 1998 the farmhouse Villa Centopino was reduced to an abandoned ruin and the fields used for the cultivation of cereals (corn, wheat, sunflowers). At the beginning of 1999 the Tuscan Centopino villa has been renovated in rustic style by Gina Francioli and Gianfranco Cambi, a part of the surrounding fields (clayey) once drained, have been transformed into beautiful orchards, in the remaining fields were planted 600 new olive trees, in addition to the few centuries-old olive trees that had survived the frost of 1986. The farm today looks like a villa in the middle of a green lawn that leads: on the right to the orchards (apple, peach, cherry, plum trees, figs, peri etc ..) and on the left to a large olive grove. 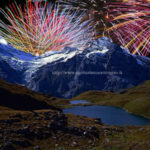 Centopino is one of the 150 companies that obtained the quality label in 2006. The extra virgin olive oil produced by the family farm is classified as PGI and has an acidity of less than 1%. The fertilizers used are absolutely biological, moreover the ban on the use of chemical pesticides or poisons, brings to the final product a result of excellence, both in terms of flavor and naturalness. The organic farm mark obtained is a demonstration of the environmental choice desired by the Tuscany villa Centopino. his inscription dates back to 528 D.c. when an earthquake hit Syria. In addition to the processions and prayers, the church, to protect the most important buildings from earthquakes, engraved on a stone, embedded in the walls, these words: Christus Nobiscum State. The meaning of these words was: Christ is with us, stop! In other words, he ordered the earthquakes to stop because the house was under the protection of Jesus Christ. The Centopino Farmhouse still retains within its walls two stones in the shape of a sphere with two ancient engravings: Christus Nobiscum State and A.D. 1857 (date of construction). he villas of the farm are located at the foot of the quaint medieval village of Montecastelli Pisano, Villa le Capanne and Villa Centopino are 3km away from each other. 50 minutes from Siena and Chianti. Walking along the edge of the pool, you can see the famous Rocca Sillana built in the thirteenth century, located at a height of 530 meters overlooking the Tuscan hills. From the lawn and the Villa you can enjoy fantastic sunsets. A natural path leads to a new tennis court, continuing the climb you can reach the pretty village of Montecastelli Pisano, where in 2015 was inaugurated the music room and a luthier where you can attend new concerts of classical music every weeks. 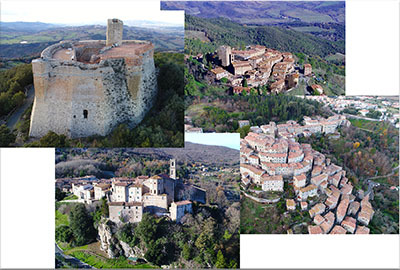 The villages of Castelnuovo di Val di Cecina and Pomarance are 10 minutes away, inside you can visit the ancient village or go shopping. There is a second path that leads from Villa le Capanne into the Mediterranean scrub and leads to the mine of Montecastelli Pisano where copper was mined in the past. Today, no longer used, it has remained an attraction thanks to its restructuring and guided tours inside. 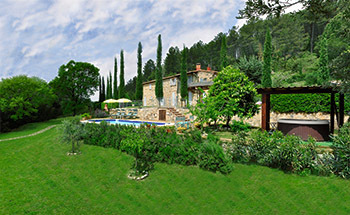 Tuscany Villa Centopino and Tuscany Villa le Capanne are located centered on the major Tuscan cities of art: Siena, Florence, Volterra, Pisa and San Gimignano. The sea of ​​Follonica is 45km and obtained in 2007 the blue flag thanks to the cleanness of its waters, not less valuable are the Etruscan Coast and the beach of Donoratico (50km). ot very well known is the natural water source of Centopino that flows for hundreds of years and that in the past has quenched most of the montecastellini, including the Francioli family. For lovers of archeology and palaeontology it will be possible to find, in the fields surrounding the Centopino villa, the ancient fossils of molluscs that date back millions of years: when the sea was still in Montecastelli Pisano.